If you have ever wanted to create pricing tables in WordPress you will quickly realise that it can be a pain! If you don’t have coding or css skills then a simple task can quickly turn into a lot of time wasted. Fortunately, there are many pricing table wordpress plugins available (both free and premium) that can get the job done faster. 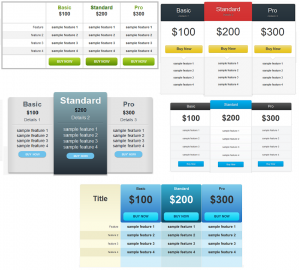 Sadly, most of them suffer from a lack of great looking design templates with a low price. Choose one of the 4 templates to create your pricing table. It’s simple to create your pricing table just watch the short video below. To pick up your copy of the plugin which you can use on all your domains, your client’s sites and sites that you flip click the buy button below.